I've loved Little Boots since her days in Dead Disco, and her debut solo effort Hands ultimately ties her with Dragonette's Fixin' To Thrill to be my overall fave record of 2009. So, it should come as no surprise that a Boots track will end up in the Top 10 -- but the real question was which one to include. "New In Town" was the first cut to see prominence by Boots in 2009, and announces her triumphantly -- her biting ode to Los Angeles and its underground culture. 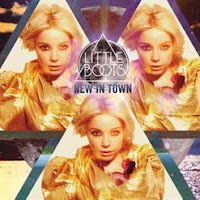 While "Remedy", "Symmetry", "Earthquake", "Meddle" and "Stuck On Repeat" (amongst the rest featured on Hands) saw ridiculous amount of personal airplay, "New" is the perfect reference to the year Little Boots has had. The album was a creative triumph, and although it didn't have the impact on the UK charts it should have, I'm hoping that this new post-Lady Gaga America will appreciate her when she begins her USA takeover in 2010. Best Part: From the minute you press play, you're sucked in. But other than that singalong chorus and the laser-like synth, I love the line "I'll take you where the music plays for free." Other Songs of Note: Pull out your copy of Hands. There you go. Other Posts RE: Little Boots: My lovefest review of Hands here. Looking Ahead: Hands is set for an American release in 2010, so she will probably be the first of my overdue UK faves making an impact stateside. Seeing as it's a Girls Aloud-free year, and my faves in Candy Coated Chaos decided to split, I was in desperate need of some good, guilt-less girl-group pop. 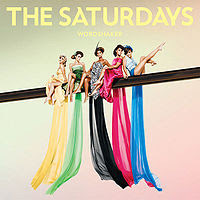 The Saturdays heard my call to arms, and provided us with their sophomore release Wordshaker. Overall, the gleam is just as sharp as on their debut Chasing Lights, but with a more mature twist. And unlike with their first, I can say with a relaxed heart that this record is much more cohesive and satisifying overall, my favorite being title track "Wordshaker". Oh, it may not be a single yet, but rest assured, when it does -- it better be the #1 that these girls have long since deserved. With the quality pop they've been producing since they busted out of the gates with "If This Is Love", it's almost mind-boggling to any pop fanatic that they haven't gotten a #1 yet. Wake up, people of the UK! You get all of the good stuff that Americans miss out on, and yet, you still let it slip through your fingers. And I'm still in the camp that this would serve as excellent crossover to American soil. Please, Fascination Records? Throw a girl a bone, here! Best Part: That downright epic synth backdrop makes it the type of song which requires the volume to be turned all the way up and then some. Also, the coining of the term 'Wordshaker'in my own vocabulary. Other Songs of Note: "Lose Control", "Ego", "Forever is Over","Denial", "Not Good Enough", oh, I should just quit while I'm ahead. Listen to the whole record. Other Posts RE: The Satz: Wordshaker love here. Looking Ahead: Per Wikipedia, the album is due for Canadian release in early 2010. Um...excuse you? A few miles to the south, please. Thank you. If not, I smell a roadtrip! Okay, as most of you probably know, I now reside in New York City, and have lived in New York State all of my life, so this should come as no real surprise. In fact, my Top 5 are all so close in terms of how much I love them, that it was beyond difficult to pick and choose what song doesn't belong in the Top 3. This song is epic smaltzy nostaglia feel-goodness minus the smaltz part. It makes non-hip hop lovers groove. It makes hip hop fans sway. Alicia's chorus gives me chills every time. It is a literal time capsule of my move to the Big City this year, and watching the video still makes me watch in awe that I am lucky enough to live here. It's even harder to believe that this is Jay's first #1 as a lead artist in the US. Words can't even being to truly encompass how much I adore this song from beginning to end, so I won't even try. I'd rather not get all emotional anyhow. ;) Suffice to say -- living here when this song is the #1 song in the country is a very cool thing indeed. Best Part: Aside from Alicia's chorus, "I made the Yankee hat more famous than a Yankee can", "I'm from the EMPIRE STATE", and "The City never sleeps, better slip you an Ambien." Other Songs of Note: Alicia's ballad-ized version literally brings me to tears on some days, and is beginning to eclipse the original. Almost. Looking Ahead: Touche, Hova. I'm paying attention now. The Blueprint 3 is easily one of the best hip hop records I've heard in awhile. And in a year that gave success to Soulja Boy Tell 'Em, that's really saying something. I think. Clue: Wait -- you'd really think I'd give you a clue into who the Top 3 are? Well, considering I am not repeating artists, there should be at least one glaringly obvious omission so far...The Top 3 will be revealed tomorrow morning (aka Christmas Morning). Happy Holidays, ya'll! Ah yes, The Saturdays. If it wasn't for your review I wouldn't have given it another chance back then. Hahah. Merry Christmas btw! It's already Christmas here so it's valid! hahah. "I'm gonna take you out tonight, I'm gonna take you tonight" isn't that one of the most catchiest choruses ever? Ooh! I remember very well how much you loved Wordshaker! That chorus is mesmerizing I love it! It is surprising they haven't got a #1 yet, every time they have a single out there's always someone in their way. 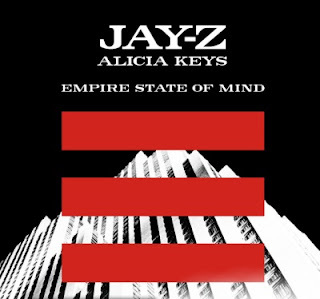 Empire State of Mind was one of my favorites this year too and as much as I love Jay-Z, I loved the song more for its chorus! I know one person in the top 3 :) a certain Lady Gaga!! Fantastic list, Great to see some Satudays Love and A few tracks I'm not really Loving - but still great though! I'm 3 for 3 with you on these. Keep the quality jams coming! You'll probably see my list on Boxing Day. I have always been a bigger fan of Stuck On Repeat, no, not the album version but the original 6 mins long version. The only 6 mins song that I can stomach that I can think of, very Kylie-ish in a good way. J - I think that's why so many people are responding to Alicia's stripped down version -- b/c you can't escape that chorus! Aaron - Good to know there is more Satz love on the blogosphere! John - :) Still can't wait for your list! I worship Epire State Of Mind - my only problem is deciding whether I love the original or Alicia's sequel more.